I’ve heard enough about the iPhone. This must be the most overly hyped thing since Paris Hilton getting out of jail. (Good thing there’s something we can over-hype just about every single day.) Speaking of Paris Hilton, if you watched her interview on CNN last night, shame on you, because you have given in to the pandering of this nation’s mass media and their decision to prioritize the utterly irrelevant. The level of hype and demand for Apple Inc.’s phone is reminiscent of the debut of the PlayStation 3 game console in November, when minor riots broke out at some electronics stores. However, eBay prices for resold PS3s quickly fell, and two months later the console was in ample supply. Remember that craze? After all the lines outside the electronic stores and the camping out and all that silliness, someone in my hometown “sold” a PS3 on eBay for some outrageous amount like $42,000. I put “sold” in quotes because I highly doubt the sale actually went through (after all, what idiot would actually make good on that?). But the insanity was sickening. Who in the world would buy a game console for three or four or six times the retail price? Do you really need it that bad right now? Don’t tell me it’s for your kids, because if that’s the case you’re sending them the wrong message by spending a small fortune on a game console and spoiling them. Now we’re seeing the fools lining up for the iPhone, so they can be the first to get their hands on this wonderfully new, wonderfully Apple-zeitgeist-marketed, wonderfully overhyped gadget. And this time these people — at least most of them — can’t even pretend it’s for their kids. Personally, I think anyone who lines up for days on end to buy a spankin’-new cool product (or to be the first to see the new Star Wars movie) is someone with waaaaaaaay too much time on their hands. In most cases, they’re students, so I might cut you some slack for curbing your boredom. But if you have a job and you took the day off, you are wasting precious hours of your life just so you can be on the cutting edge of … what? The “cool” Apple mindset? The thing that gets me: This is a freaking PHONE. Sure it plays MP3s and gives you (allegedly) great Internet and all that terrific stuff. But I just can’t see spending $500 on a phone. I could buy a notebook computer for that. Granted, not a great one, and I can’t put a notebook computer in my pocket and answer phone calls — but I’m probably less likely to lose my $500 notebook computer than my phone. We are obviously just a bunch of gadget-crazy idiots. Well, okay, not me. And by Saturday it will be out of date. I totally agree with your rant on this stupid phone. It’s crazy what people will do to get something that in the long run seems to be just overhyped junk. I don’t even have an iPod. I refuse to buy one of those or an iPhone on general principle. It will be a cold day in hell before I give Steve Jobs a nickel. At least the iPod makes sense. Portable music with good sound quality has been in demand for years. I have an iPod, and it’s great for working out and hooking up to my car radio. I can keep a huge portion of my song collection in one place. For me, that technology makes sense. But with the iPhone, I just don’t see where the demand is. How many people really want to be surfing the internet on a phone? I can’t imagine it being anything other than tedious to operate. It’s also interesting to note that the iPhone’s internet capabilities apparently have no serious functions. Every commercial I’ve seen for it involves being able to watch YouTube videos on the go. I camped for PS3s, Wiis, accessories and yes even took time off work. The Wiis and accessories actually sold quite well on ebay. Less luck with the PS3s though. Eh, it was still a fun experience. The cell phone is the twenty-first century Swiss Army knife. The iPhone is the same if, you know, Swiss Army knives had rocket launchers and personal cloaking devices and interdimensional rift openers and phaser cannons and…. Well I for one don’t see what has YOU so upset. The iPhone does a lot of really cool stuff. Just because it isn’t your thing doesn’t mean you need to rip into the people who ARE into it. I should say that I’m never going to spend that kind of money on a phone (even if it has an amazing touchscreen that orients itself based on how you’re holding the phone, an ipod, a quality web browser, and any number of other really cool stuff inside), but I was willing to pay an extra 100$ to get my hands on a Wii–so obviously I can’t claim to be perfect. I like what I like. What can I say? I’ve had a lot of fun with that system over the last few months and I reckon that for me the money was well spent. I’m sure that wouldn’t be true for everyone…but still…I just don’t get the point of being judgemental and acting like everyone should think the way you do. 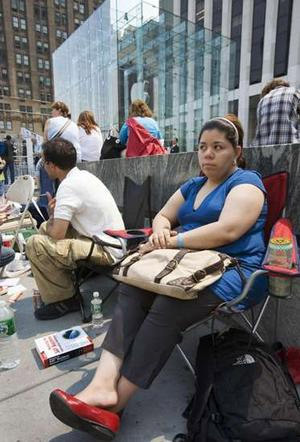 ^ I’m mostly laughing at people standing in line DAYS IN ADVANCE before the iPhone comes out. This blog is meant to be snarky and judgmental and should be taken with a grain of salt. It’s not a direct attack on people or the iPhone. I would never buy an iPhone, but I don’t have a problem with those who do. I think you’re taking me too seriously here. My friend Mike I’m sure loves the iPhone. He probably won’t spend $500 on one, but I think he’ll understand my ribbing on all things Apple as not really that serious. He’s one of those Mac guys, so that means I have to be even more of a PC guy, just to keep the war alive. The iPhone hasn’t been released here yet, and I can’t believe the hype and discussion I’ve seen which has crossed the Pacific, as well as the stuff that can be found plastered across the internet. How can reinventing the wheel reap 1 company millions? “I ran out of bullets. Heh, I remember being in a Verizon store getting a warranty replacement on my phone. Some guy ahead of me in line was describing his phone problem to the counter staff. Apparently he didn’t realize he had dropped his phone until he ran over it with his car. Screen was cracked and nonfunctional, hinge was broken (it was a flip phone) but he was still able to make and receive calls on it. Pretty neat. Can’t do that if your phone’s dependent on the screen for input. Knucklehead newscaster on one of the cable news channels pointed out that the iPhone could show videos, connect to the internet, play music, and make phone calls. I have an LG VX8600 cell phone and it does all of these things plus it has a camera that does videos and still photos! But it doesn’t have a flat, can’t see in the sunlight, multipurpose, all in one, fancy, can only use ATT, cost too much, crackable screen! I still need to see Die Hard 4. Sounds hilarious. And now it is time for the Iphone part 2. Oh joy.